The Seahawks blew out the 49ers, 43-16, Sunday afternoon at CenturyLink Field. They have lost 10 straight to their NFC West foe. Here are five observations from San Francisco’s loss. 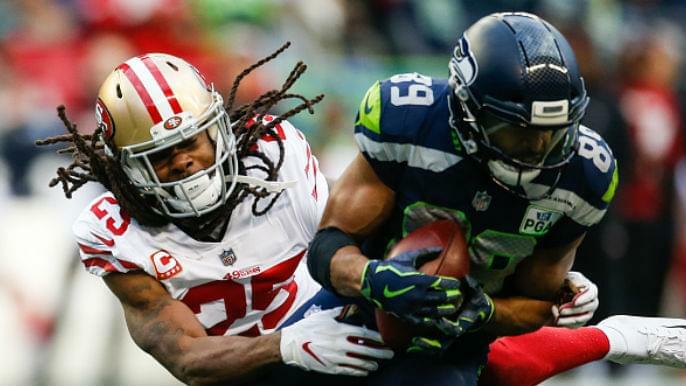 Like any undermanned, lesser-talented team, the 49ers could not afford to gift the Seahawks with extra opportunities. The 49ers entered Sunday with 22 giveaways, tied for the third-most in the NFL, with a -17 turnover differential on the year. They lost the turnover battle, again, 3-0, Sunday. Their first giveaway ruined their most promising offensive drive up to that point, in the second quarter, when rookie Jeff Wilson fumbled the ball away in the red zone. Later in the second quarter, rookie Richie James muffed a punt, and the Seahawks recovered. Five plays later, they scored a touchdown to extend their lead to 20-0. The last of San Francisco’s turnovers came on a Bobby Wagner 98-yard interception return for a touchdown with about four minutes left in the game. San Francisco’s poor first half was arguably its worst 30-minute stretch of the season. The 49ers did not score until Robbie Gould connected on a 45-yard field goal to close the half. Defensively, the same communication/coverage issues we saw earlier in the season resurfaced. Russell Wilson found Jaron Wilson wide open on a 48-yard pass that ultimately led to Seattle’s first touchdown. It was not until the second half that San Francisco’s pass rush affected Wilson, who threw three touchdowns on six attempts in the first half alone. The 49ers dug themselves into too deep of a hole because of the same self-inflicted miscues. The storyline that dominated this game was Sherman playing his first game in Seattle as an opponent. With exception to Seahawks players reenacting Sherman’s famous tip play in the 2013 NFC Championship Game, his return was uneventful. His first target of the day did not come until the third quarter. Wilson found Doug Baldwin, who made Sherman miss a tackle before picking up a 21-yard gain. Later in the drive, Seattle scored its fourth touchdown of the day when targeting Sherman. Wilson scrambled and found Brown for 18 yards in the end zone. For the second straight week, Ahkello Witherspoon outplayed Sherman. Witherspoon was targeted four times and did not allow a catch, although he was flagged for pass interference on the goal line in the fourth quarter. He nearly had an interception with about 12 minutes left in the fourth quarter, but the ball slipped through his hands. The Seahawks did not challenge Sherman much because they did not have to. They never trailed. They relied on their rushing attack, which compiled 168 yards. The 49ers have struggled to turn red-zone opportunities into touchdowns all season long. They entered Sunday scoring touchdowns on 47 percent of red-zone trips, the 29th-best mark in the NFL. The 49ers converted one of their four red-zone trips into touchdowns. They squandered two of those chances Sunday with turnovers. The first was Wilson’s fumble in the second quarter. The same came during garbage time, when Wagner intercepted Mullens for a 98-yard touchdown. Mullens was consistently under pressure that prevented him from extending plays that went awry. The value in the remainder of the 2018 season lies in the 49ers developing their young players. And the one blossoming most in recent weeks has been second-round pick Dante Pettis. He followed last week’s four-catch, 77-yard, one-touchdown performance last week with a career day Sunday in Seattle. He caught five passes for 129 yards and two touchdowns, including a 75-yard touchdown in which he outran the Seattle secondary in a dead sprint upfield. Pettis has emerged with Marquise Goodwin and Pierre Garcon missing each of the past two games. Kyle Shanahan has reiterated that Pettis looks healthier than he has since before hurting his knee in Week 4. He missed six games this season as he allowed his knee to recover. Since returning from the bye week two weeks ago, he has been dynamic, beating opposing cornerbacks with crafty route-running and burst after the catch. Pettis’ recent emergence should yield excitement for the final four games of the season and beyond. Mullens completed 30 of 48 pass attempts for 414 yards, two touchdowns, and one interception. He racked up the most yardage for a 49ers quarterback in a single game since Tim Rattay amassed 417 passing yards on Oct. 10, 2004. Sure, a considerable chunk of Mullens’ production came when it did not matter. The game quickly got out of reach. When the Seahawks scored a touchdown 14 seconds into the second half, extending their lead to 24, the 49ers needed to play a perfect game thereafter, and they did not. But Mullens moved the ball effectively. He consistently hit the open receiver despite facing constant pressure. He did not turn the ball over for the first 56 minutes of the game. His performance should be enough for Mullens to start his fifth career NFL game, rather than backup C.J. Beathard, next Sunday vs. Denver.